Every year the Southeast Climate Adaptation Science Center funds a multi-disciplinary cohort of Global Change Fellows representing colleges across NC State University. Here are some highlights about 2018-19 Fellow, Danielle Lawson, and the applied research she’s conducting. Danielle Lawson, a Global Change Fellow at the SE CASC and current NCSU PhD student will be defending her dissertation on January 18th at 2pm in Jordan Hall 1214. 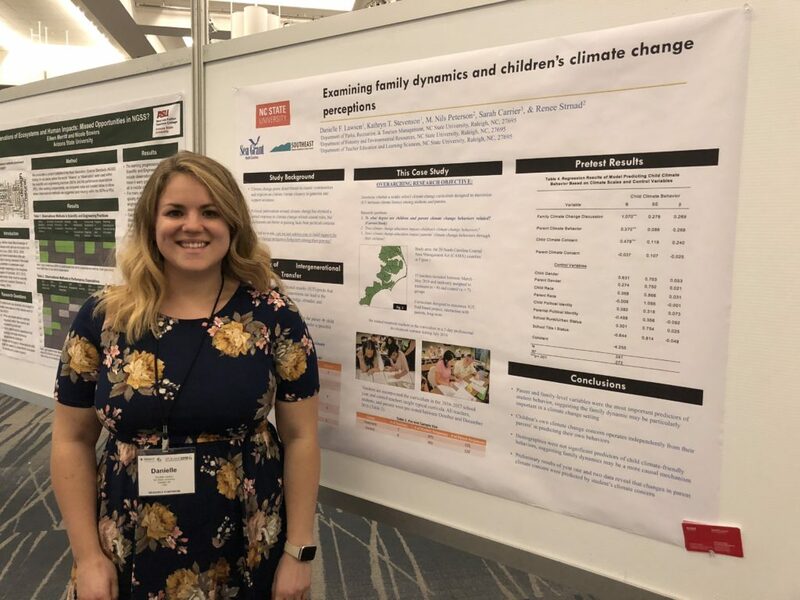 Her research project, entitled “Evaluating Climate Change Behaviors and Concern in the Family Context”, leverages the unique environmental views of children to influence the adults in their lives. Specifically, she experimentally tested a middle school wildlife-based, climate change curriculum that aims to increase the climate literacy of both the students and the adults in their lives. Danielle was featured in an April 2018 Researcher Spotlight but we wanted to catch up with her and provide an update on the progress of her research and experiences as a Global Change Fellow. What results are you finding? That younger generations, particularly in the K-12 age range, are agents of change, and we can help empower them to continue this pattern. So far, we have found that children’s perceptions of climate change are independent of their parent’s perceptions when predicting if a child is likely to engage in climate mitigation behaviors. We have also found that children have the ability to increase their parents’ level of climate concern, even among parents who identify as the biggest deniers. How have your research results changed or developed since your last Researcher Spotlight? In my previous research spotlight, I did not yet have results from my experiment – I only had results from my pre-test surveys. My research, and therefore the experiment, are now finished. We found that children do indeed influence the climate concern of their parents, particularly among the most politically conservative and male parents. What do you most enjoy about educating others within a field that you are passionate about? I am passionate about helping translate research to practice, and I think the most effective way to do that is through education, particularly of K-12 students. Have you experienced any direct instances of your research being applied to and benefiting the greater community? Please share some of that experience. In some ways. I have only been able to have informal conversations with a few parents who decided to contact me with questions. I love hearing from them directly how their students are impacting their lives. Outside of conversations with parents, I interacted with teachers regularly. As all of my teachers were on the NC coast, I loved hearing how our curriculum helped facilitate classroom conversation about Hurricane Matthew. It allowed to students to talk about what they experienced personally, and how they could help. What new skills have you acquired from conducting your research? I have learned how to effectively communicate complex subjects, like climate change. There is a beauty in getting to sit down with someone who thinks differently than you, and have a productive conversation together. What has been the biggest obstacle for you working in this field and/or doing this research? My biggest obstacle has been very practical in nature – survey response. Finding ways to increase survey numbers from parents without being able to contact them directly is incredibly difficult. What has been the most rewarding part of being a SE CASC Global Change Fellow? Having the opportunity to interact and form partnerships with a diverse set of individuals – professors, research scientists, tribal members, federal employees, practitioners, and my fellow NCSU graduate students. I truly believe my exposure to all the good work being done by these individuals has made me a more effective researcher. You mention that you see yourself working within academia or government? Do you have a specific job in mind? No specific job, just yet, mostly due to the fact that I think I can accomplish what I want to do in a variety of settings. My overall career goal is to help us as a greater society work towards conservation-minded solutions to environmental issues, through inclusion of all voices. What advice would you give to a student is interested in getting involved in your field? I have found that is can be very discouraging to work in the field of global change. However, do not let the popular media narrative of hopelessness discourage you! There are numerous people doing good work, novel communication methods to be discovered, and issues to tackle from an interdisciplinary perspective. I personally find everything occurring in this arena to be very hopeful.